Pacific Steam's Ortona was built by Vickers, Sons and Maxim, of Barrow. Launched in 1899, she made her maiden voyage on 24 November 1899, in the joint Pacific Steam/Orient Line service from Liverpool to Australia via Suez. From 1901 to 1906, this service went under the name "Orient-Pacific Line", which appears on this card. 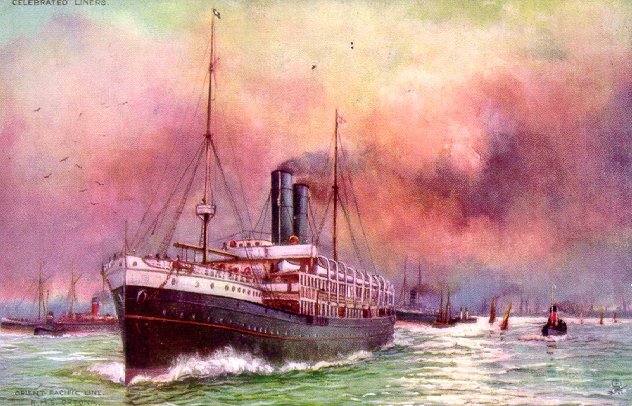 Royal Mail Steam Packet Co. acquired Pacific Steam in 1906 and ended the joint service with Orient Line in 1909. 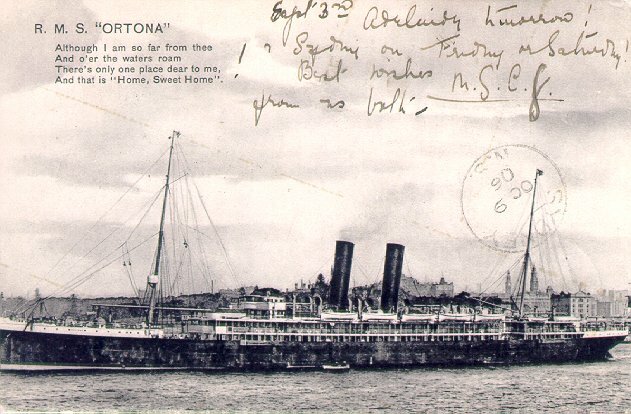 Ortona was then converted into a cruise ship and was renamed Arcadian. She became a troopship in 1915, and served as the headquarters ship for Sir Ian Hamilton during the Gallipoli campaign. On 15 April 1917, she was torpedoed while en route from Salonika to Alexandria. She sank within five minutes, with the loss of 277 lives out of the 1,335 on board. Sources: Haws' Merchant Fleets; Williams' Wartime Disasters at Sea.